In lieu of flowers, memorial donations may be made to the El Do Youth Center. Waukita loved children and loved the idea of children having a place to call their own. Donations may be mailed to El Do Youth Incorporated, P.O. Box 52, El Dorado Springs, MO 64744. Waukita (Steffens) Eshleman, age 90, of El Dorado Springs, Missouri, passed away Monday morning, January 16, 2017. Waukita was born May 27, 1926, in Raymondville, Missouri, the daughter of Clyde and Hattie Steffens. Waukita attended Rosedale High School in Kansas City, Kansas. Waukita married Edwin Eshleman on July 3, 1947. They were married 27 years before Ed’s passing in 1974. Together they had three children. 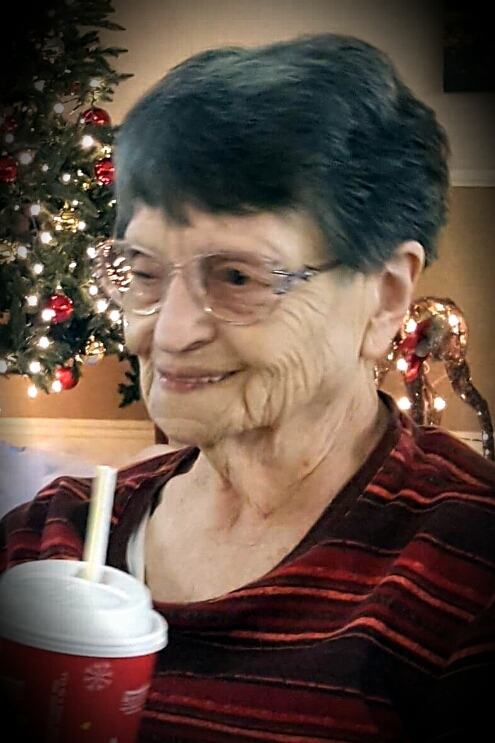 After Ed’s passing, Waukita worked as a Certified Medicine Technician at Resthaven Retirement Home in Independence, Missouri, where she later retired. After retirement, she remained in Independence, Missouri, for several years until she moved to El Dorado Springs to be closer to family. Preceeding her in death were her husband, Edwin; her parents; all four of her siblings, Violet Wells, Marjorie Cox, Hank Steffens, Herbert Steffens; and one grandchild, Angela Eshleman. Survivors include her three children: Joe Eshleman and wife Giala of Goodyear, Arizona; Barbara Hazelrigg and husband Kenneth of Stockton, Missouri; Renee Hetrick of Kansas City, Missouri; grandchildren: Natalie Eshleman, Jerry Eshleman, Michelle Jackson, Nikki Ahrens, Kimberly Cox, Brigette Bardwell, Nikkolas Hetrick, Noel Hetrick; great-grandchildren: Ronnie Crowe, Jordan Crowe, Tabitha Draper, Cortney Bardwell, Kaylen Bardwell, McKenzie Bardwell, Samantha Cox, Levi Ahrens, Dante Williams, Treyson Williams; and great-great-grandchildren: Tahlia Crowe, Kiya Virnig, Izadora Virnig. A visitation/celebration of life will be held on Saturday, January 21, 2017, from 11 a.m. to noon at Bland-Hackleman Chapel. Arrangements are under the direction of Bland-Hackleman Funeral Home.